THE DUTIES in respect of DEEDS and other Instruments, and the Allowances in respect of the said Duties. ADMISSION of any person to act as an Advocate in any of the Ecclesiastical Courts, or in the High Court of Admiralty in England, or as a Member of the Faculty of Advocates in Scotland £. s. d.
Exemption from the preceding and all other Stamp Duties. Where an Advocate, admitted in one Court in England, shall be admitted as an Advocate in any other Court in England, his latter admission shall be free of Duty, provided he shall have paid the proper Stamp Duty on his former admission according to the laws then in force. Exemptions from the preceding and all other Stamp Duties. Where any person, duly admitted an Attorney in either of His Majesty's Courts at Westminster, or in either of the Courts of the Great Sessions in Wales, or of the Counties Palatine of Chester, Lancaster and Durham, shall be also admitted to act as an Attorney in any other of the said Courts, or in any inferior Court of Law, or as a Solicitor in any Court of Equity in England, the latter admission shall be free of Duty. And where any person, duly admitted a Solicitor in the Court of Chancery or Exchequer at Westminster, or in either of the Courts of the Great Sessions in Wales, or of the Duchy of Lancaster, or of the Counties Palatine of Chester, Lancaster and Durham, shall be also admitted to act as a Solicitor in any other of the said Courts, or in any inferior Court of Equity, or as an Attorney in any Court of Law in England, the latter admission shall be free of Duty. Provided such Attorney or Solicitor shall have paid the proper Stamp Duty on his former admission, according to the laws then in force. But in all cases, not expressly exempted, the said Duty is to be paid on every admission of the same person. 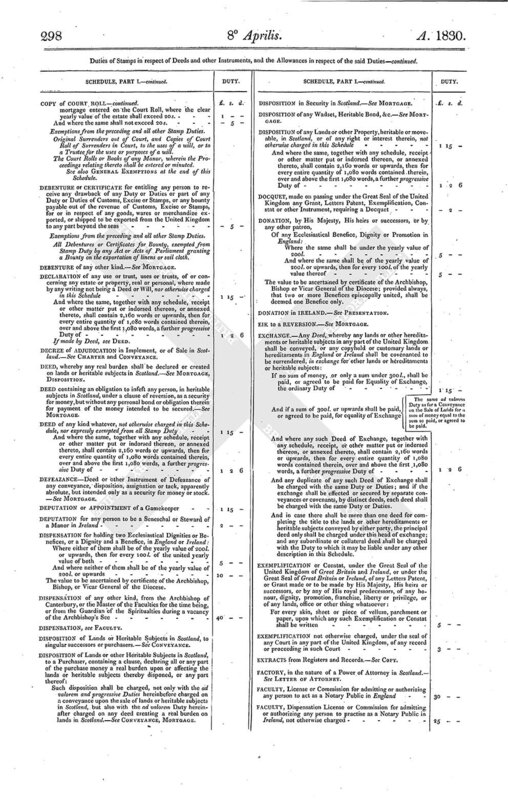 Provided always, That neither of the said further Duties shall be charged upon any admission of a person who shall either have before served a clerkship or apprenticeship for five years, to a Writer to the Signet, or to an Attorney or Sworn Clerk in the Court of Exchequer, or to a Solicitor in the Supreme Courts, or to an Agent in the Court of Session in Scotland, under regular articles or indentures of clerkship or apprenticeship, completely executed before the 10th day of October 1808, and upon which shall have been paid the Stamp Duty payable by law for the same at the date thereof; or who shall have before obtained a duly stamped admission to act in any one of the capacities mentioned in this clause, dated subsequently to the 10th day of October 1808, and upon which an appropriate further Duty shall have been paid. And provided, That no person who may be liable to a further Duty upon his first admission to act in any of the capacities mentioned in the immediately preceding clause of this Schedule, shall be charged with a higher further Duty than 30£. upon such admission; if he shall have before obtained a duly stamped admission to act in any one of the said capacities of a Procurator in the High Court of Admiralty, or a Procurator or Solicitor in the Commissary Court of Edinburgh, or in any inferior Court in Scotland, dated subsequently to the 10th day of October 1808, and upon which an appropriate further Duty shall have been paid. And likewise provided. That neither of the said further Duties shall be charged upon the admission of any person to act as a Procurator in the High Court of Admiralty, or as a Procurator or Solicitor in the Commissary Court of Edinburgh, or in any inferior Court in Scotland, who shall have before served a clerkship or apprenticeship for five years to a Writer to the Signet, or to an Attorney or Sworn Clerk in the Court of Exchequer, or to a Solicitor in the Supreme Courts, or to an Agent in the Court of Session, or to a Procurator or Solicitor in some other Court in Scotland, under regular articles or indentures of apprenticeship, completely executed before the 10th day of October 1808, and upon which shall have been paid the Stamp Duty payable by law for the same at the date thereof. Where any person, duly admitted to act in any of the said capacities of a Writer to the Signet, an Attorney or Sworn Clerk in the Court of Exchequer, a Solicitor in the Supreme Courts, or an Agent in the Court of Session in Scotland, shall be also admitted to act in any other or others of those capacities, his latter admission or admissions shall be free from the said Duty of 25 l.
And where any person, duly admitted to act as a Procurator or Solicitor in the Commissary Court of Edinburgh, or in any inferior Court in Scotland, shall also be admitted to act as a Procurator or Solicitor in any other or others of the same Courts, his latter admission or admissions shall be free from the said Duty of 25 l.
Provided, That in each of the foregoing cases, the first or other previous admission shall have been obtained subsequently to the 10th day of October 1804, and shall have been duly stamped according to the laws in force at its date or since. But in all cases not expressly exempted, the said Duty of 25£. is to be paid on every admission of the same person. Where any person, duly admitted an Attorney, Solicitor or Proctor, in any of His Majesty's Superior Courts at Dublin, or in the Court of Prerogative, or Consistorial Court in Dublin, shall be also admitted as an Attorney, Solicitor or Proctor in any other of the said Superior Courts, or in any Inferior Court of Law or Equity, or any other Ecclesiastical Court in Ireland, the latter admission shall be free of Duty. Provided such Attorney, Solicitor or Proctor shall have paid the proper Stamp Duty imposed on his first admission. But in all cases not expressly exempted, the said Duty is to be paid on every admission of the same person. The said fees and emoluments to be estimated according to the average amount thereof for three years preceding, if practicable; and if not, according to the best information that can be obtained. Where any officer shall be admitted annually, every admission after the first shall be free of Duty, provided the proper Duty shall have been paid on his first admission. All admissions of officers, proceeding upon any grants of or appointments to officer, which shall be charged with the Duties hereinafter mentioned. But in all cases not expressly exempted, the proper Duty is to be paid on every admission of the same person. ADMISSION of any person to act as a Notary Public.-See FACULTY. One Duty only to be payable by any person in respect of his admission into any Corporation, and into any Guild or Guilds thereto belonging; such Duty to be payable on the first of such admissions. The admissions of craftsmen or others entering into any Corporation within any Royal Burgh, Burgh of Regality, or Burgh of Barony in Scotland, incorporated by the magistrates and council of such Burgh, provided such craftsmen or others shall have been previously admitted freemen or burgesses of the Burgh, and have paid the proper Stamp Duty on such admission, according to the laws then in force. The admission of any person into a Corporation or Company exclusively for the direction of any charitable institution. ADMISSION or Admittance to Copyhold Lands.-See COPYHOLD. ADMISSION to Ecclesiastical Benefices.- See COLLATION; DISPENSATION; DONATION; FACULTY; GIFT; INSTITUTION; LICENSE; and PRESENTATION. Affidavits made before any Justice or Justices of the Peace, or before any Commissioner or Commissioners of any public Board of Revenue, or any of the officers acting under them, or before any other Commissioner or Commissioners appointed or to be appointed by Act of Parliament. Affidavits made regarding the value of the estate and effects of deceased persons, by persons applying for probates of wills or letters of administration in England or Ireland, or exhibiting inventories of such estate, and effects in Scotland, or by persons claiming a return of Stamp Duty paid upon such probates, letters of administration, or inventories respectively. Affidavits relating to Criminal Prosecutions. Affidavits for the purpose of registering Freeholds in Ireland. 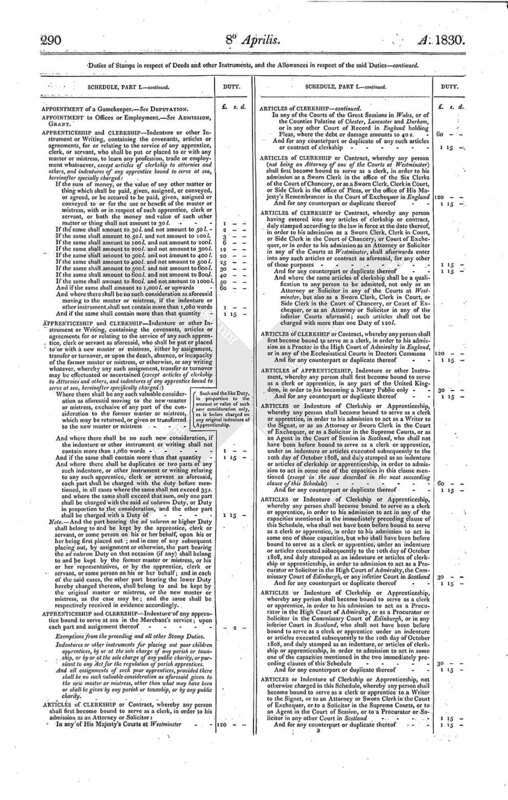 Affidavits which may be required at the Banks of England or Ireland to prove the death of any proprietor of any share in any of the stocks or funds transferable there, or to identify the person of any such proprietor, or to remove any other impediment to the transfer of any such stocks or funds, or in anywise relating to the loss, mutilation or defacement of any Bank note or Bank post bill. Affidavits to be taken in Ireland before a magistrate acting in any Court of Conscience, or of summary jurisdiction in any Manor Court, or before any Judge of assize, Commissioner of oyer and terminer, or Recorder or assistant Barrister relative to prosecutions or trials of indictments, or to civil bills. 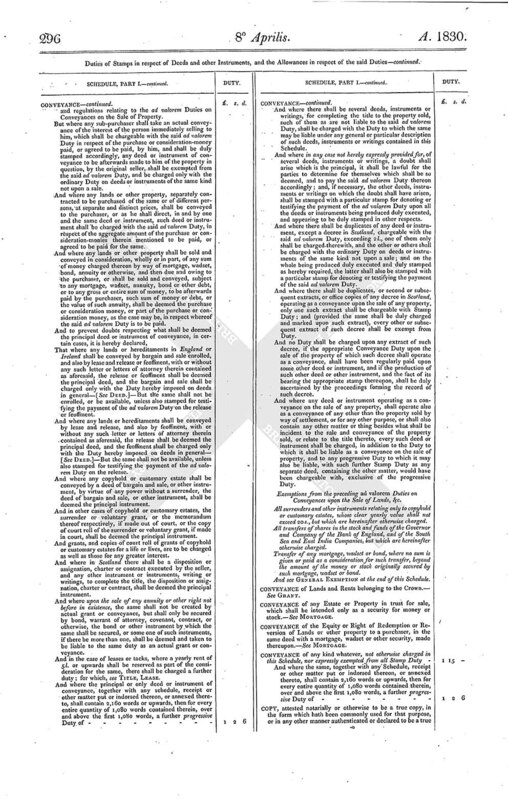 Affidavits made in Ireland in pursuance of any Act relative to the Hempen or Linen Manufactures, and Affidavits as to the payment of Corn Premiums, and Affidavits made before the Dublin Society. See also the GENERAL EXEMPTIONS at the end of this Schedule. AGREEMENT or Contract, accompanied with a Deposit of Title Deeds for making a mortgage, wadset, or other security on any estate or property therein comprized.- See MORTGAGE. AGREEMENT, or any Minute or Memorandum of an Agreement, for a lease or tack.-See LEASE. Provided always, That where divers letters shall be offered in evidence to prove any agreement between the parties who shall have written such letters, it shall be sufficient, if any one of such letters shall be stamped with a Duty of 1£. 15s. although the same shall, in the whole, contain twice the number of 1,080 words or upwards. Label, Slip, or Memorandum, containing the heads of Sea Insurances or Fire Insurances to be made by the Corporation of the Royal Exchange Assurance and London Assurance respectively. Memorandum or Agreement for the hire of any labourer, artificer, manufacturer, or menial servant. Memorandum, Letter or Agreement made for or relating to the sale of any goods, wares or merchandize. Letters containing any Agreement (not before exempted) in respect of any merchandize or evidence of such an agreement, which shall pass by the post, between merchants or other Persons carrying on trade or commerce in the United Kingdom, and residing and actually being at the time of sending such letters at the distance of fifty miles from each other. ANNUITY, Deed granting any, for a pecuniary consideration.-See CONVEYANCE and BOND. ANNUITY DEED, whether voluntary or gratuitously, or upon any good or valuable consideration, other than a pecuniary consideration.-See SETTLEMENT. But if such original grant hath not paid such ad valorem Duty, then such Release or Conveyance shall pay the same Duty as on an original grant of an annuity; for which, see BOND, CONVEYANCE. If made by Deed, see DEED. APPOINTMENT of a Gamekeeper.-See DEPUTATION. APPOINTMENT to Offices or Employment.-See ADMISSION, GRANT. Where there shall be any such valuable consideration as aforesaid moving to the new master or mistress, exclusive of any part of the consideration to the former master or mistress, which may be returned, or given or transferred to the new master or mistress Such and the like Duty, in proportion to the amount or value of such new consideration only, as is before charged on any original indenture of Apprenticeship. Note.-And the part bearing the ad valorem or higher Duty shall belong to and be kept by the apprentice, clerk or servant, or some person on his or her behalf, upon his or her being first placed out ; and in case of any subsequent placing out, by assignment or otherwise, the part bearing the ad valorem Duty on that occasion (if any) shall belong to and be kept by the former master or mistress, or his or her representatives, or by the apprentice, clerk or servant, or some person on his or her behalf; and in each of the said cases, the other part bearing the lower Duty hereby charged thereon, shall belong to and be kept by the original master or mistress, or the new master or mistress, as the case may be; and the same shall be respectively received in evidence accordingly. Indentures or other instruments for placing out poor children apprentices, by or at the sole charge of any parish or township, or by or at the sole charge of any public charity, or pursuant to any Act for the regulation of parish apprentices. And all assignments of such poor apprentices, provided there shall be no such valuable consideration as aforesaid given to the new master or mistress, other than what may have been or shall be given by any parish or township, or by any public charity. Provided always, That the said duty of 60£. shall not be charged upon any clerkship or apprenticeship of a person who shall have before obtained a duly stamped admission to act in any one of the said capacities of a Writer to the Signet, or an Attorney or Sworn Clerk in the Court of Exchequer, or a Solicitor in the Supreme Courts, or an Agent in the Court of Session in Scotland, dated subsequently to the 10th day of October 1808, and upon which an appropriate further Duty shall have been paid. And likewise provided, That no higher Duty than 30£. shall be charged upon any clerkship or apprenticeship, in order to admission to act as a Writer to the Signet, or as an Attorney or Sworn Clerk in the Court of Exchequer, or as a Solicitor in the Supreme Courts, or as an Agent in the Court of Session in Scotland; if the clerk or apprentice shall have before obtained a duly stamped admission to act as a Procurator or Solicitor in some one of the other Courts in Scotland, dated subsequently to the 10th day of October 1808, and upon which an appropriate further Duty shall have been paid. And likewise provided, That the said Duty of 30£. shall not be charged upon any clerkship or apprenticeship, in order to admission to act as a Procurator in the High Court of Admiralty, or as a Procurator or Solicitor in the Commissary Court of Edinburgh, or in any inferior Court in Scotland; if the clerk or apprentice shall have before obtained a duly stamped admission to act in any one of those capacities, dated subsequently to the 10th day of October 1808, and upon which an appropriate further Duty shall have been paid. ARTICLES of CLERKSHIP, or Contract, or Indenture of Apprenticeship, whereby any person having been before bound to serve as a clerk or apprentice, in order to any such admission as aforesaid, or in order to his becoming a Notary Public, either in England, Scotland or Ireland, and not having completed or perfected his service, so as to entitle him to such admission, or to become a Notary Public, shall become bound afresh, for a new term of years, for the same purpose The same Duty as would be payable on any original articles, contract, or indenture for such purpose. But in this case, the Stamp used on the Articles, Contract, or Indenture first entered into for the said purpose, shall be allowed as a spoiled stamp, on being delivered up to the Commissioners of Stamps, to be cancelled within six calendar months after the execution of the new Articles, Contract, or Indenture. ASSIGNATION or Assignment, upon the Sale of any Property.-See CONVEYANCE. ASSIGNATION of any Wadset, Heritable Bond, &c.-See MORTGAGE. ASSIGNMENT of any Mortgage, or other similar Security.-See MORTGAGE. BILL of SALE absolute.-See CONVEYANCE. BILL of SALE as a Security.-See MORTGAGE. And where the money secured, or to be ultimately recoverable thereupon, shall be limited not to exceed a given sum The same Duty as on a Bond for such limited sum. BOND in England or Ireland, and personal Bond in Scotland, given as a security for the transfer or re-transfer of any share in any of the Government or Parliamentary Stocks or Funds, in any part of the United Kingdom, or in the Stock and Funds of the Governor and Company of the Bank of England, or of the Governor arid Company of the Bank of Ireland, or of the East India Company, or of the South Sea Company, or of any other Company or Corporation. The same Duty as on a Bond for a sum of money equal to the value of the Stock or Fund secured according to the average (price thereof, on the day of the date of the Bond, or on either of the ten days preceding. Heritable BOND in Scotland for any of the purposes aforesaid.-See MORTGAGE. BOND in England or Ireland, and Personal or Heritable Bond in Scotland, given as the only or principal security for the payment of any annuity upon the original creation and sale thereof.-See CONVEYANCE upon the Sale of Lands, &c.
BOND in England or Ireland, and Personal or Heritable Bond in Scotland (not liable to and charged with the ad valorem Duty hereinafter imposed on conveyances upon the sale of any property), given as a security for the payment of any annuity, or of any sum or sums of money at stated periods (not being interest for any principal sum nor rent reserved or payable upon any lease or tack), for any definite and certain term, so that the total amount of the money to be paid can be previously ascertained. The same Duty as on a Bond of the like nature, for the payment of a sum of money equal to such total amount. BOND, accompanied with a deposit of Title Deeds, for making a Mortgage, Wadset, or other security, on any estate or property therein comprised.-See MORTGAGE. Back BOND, Declaration, or other deed or writing, for making redeemable any Disposition, Assignation or Tack, apparently absolute, but intended only as a security,-See MORTGAGE. And where any such Bond as aforesaid shall be given as a security for the payment of a sum of money, and also of a share in any of the stocks or funds before mentioned, or an annuity, or both, or for the payment of an annuity, and also of a share in any of the said stocks or funds, the proper ad valorem Duty shall be charged in respect of each. And where any such Bond as aforesaid shall be given as a security for the payment or transfer to different persons of separate and distinct sums of money, or annuities or shares in any of the stocks or funds before mentioned, the proper ad valorem Duty shall be charged in respect of each separate and distinct sum of money, or annuity or share in any of the said stocks or funds therein specified and secured, and not upon the aggregate amount thereof. And where any Bond shall be given as a security for the performance of any covenant or agreement for the payment or transfer of any sum of money or annuity, or any share in any of the stocks or funds before mentioned, such Bond shall be charged with the same Duty as if the same had been immediately given for the payment or transfer of such money or annuity, or share of the said stocks or funds. And where any Bond for the payment or transfer, or for the performance of any covenant for the payment or transfer of any sum of money or annuity, or any share in any of the stocks or funds before mentioned, shall be contained in one and the same deed or writing, with any other matter or thing in this Schedule specifically charged with any Duty (except any declaration of trust, of the money, annuity, stock or fund secured), such deed or writing shall be charged with the same Duties as such bond and other matter or thing would have been charged with, if contained in separate deeds. But where a Bond for the performance of covenants or agreements (other than for the payment or transfer of any sum of money, or annuity, or any share in any of the said stocks or funds) shall be contained in the same deed or writing with any other matter or thing, the same shall not be charged separately, but the whole shall be considered as one deed, and be charged accordingly under its proper denomination. And in all cases where any deed of covenant or other instrument or writing shall be used for any of the purposes aforesaid, such deed of covenant or other instrument or writing shall be charged with the same Duty as is hereby imposed, in case a Bond had been used for such purpose, except such deed of covenant or other instrument or writing is specifically charged with any other Duty. 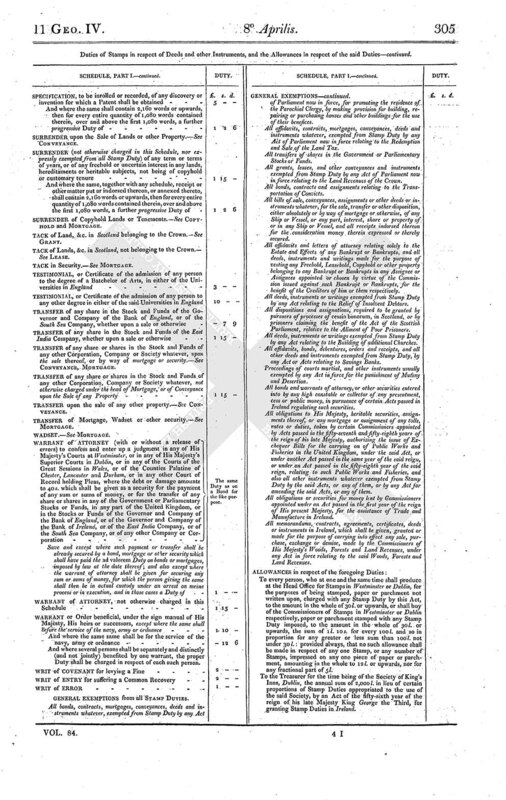 Bonds of the Royal Exchange and London Assurance Corporations exempted from Stamp Duty by the Act of the 6th year of the reign of King George the First, under which they were incorporated. Bonds and other securities exempted from Stamp Duty by any Act now in force for the encouragement of British Fisheries. Bonds exempted from Stamp Duty by any Act now in force relating to the exportation of wool, or any manufacture thereof, or fuller's earth, fulling clay or tobacco-pipe clay, or by any Act now in force relating to the exportation of tobacco from His Majesty's warehouses. Coast Bonds, or Bonds relative to the carrying of goods or merchandize coastwise, whether the same shall be given pursuant to any Act now in force, for the relief of the coast trade of Great Britain, or pursuant to the directions of any proclamation or order in council, by His Majesty, His heirs or successors. Bonds and other securities exempted from Stamp Duty by any Act now in force for the encouragement of Friendly Societies. Bonds given by card-makers or dice-makers pursuant to any Act relating to the Stamp Duties on playing cards or dice. Bonds given by the proprietors, printers or publishers of Newspapers, for securing the payment of the Duties upon the advertisements therein contained. Bonds given by stationers and others, who sell stamped paper for the printing of Newspapers, for the due performance of the matters required of them by any Act regulating the printing and publication of Newspapers. Bonds given by collectors of assessed taxes and their sureties, for the due payment of monies collected by them, or otherwise relating to their offices. Bonds given to the Lord Chancellor, Lord Keeper or Commissioners of the Great Seal of Great Britain or Ireland respectively for the time being, by any creditor or creditors petitioning for a commission of Bankrupt, and Bonds given to any Sheriff or other person upon the replevy of any goods or chattels, and also any assignment of any such Bonds. Administration and Confirmation Bonds, given by the widow, child, father, mother, brother or sister of any common seaman, marine or soldier, who shall be slain or die in the service of His Majesty, His heirs or successors. Administration Bond in England or Ireland, given by any person where the estate to be administered shall not exceed 20£. in value. Confirmation Bond in Scotland, where the whole personal estate of the deceased shall not exceed 20£. in value. Bonds to procure the admission of any child into any charitable Institution in Ireland. But no one person is to be obliged to take out more than one Certificate, although he may act in more than one of the capacities aforesaid, or in several of the Courts aforesaid. All clerks and officers of any of the Courts aforesaid, who shall act or be concerned in the conduct or management of any action, suit, prosecution or other proceeding, by virtue and in execution of their respective offices or appointments only, and shall not be also retained or employed by any party to such action; suit, prosecution or other proceeding, or by any Attorney, Solicitor, or Proctor, on behalf of any party thereto, for or in expectation of any fee or reward, other than the established fees due and payable in respect of their offices and appointments. Serjeants at Law and Barristers. Attornies, Solicitors, Proctors, and also Notaries Public, and other persons acting as such by virtue of any office or appointment, who shall respectively take out certificates in those characters. Public officers drawing or preparing deeds or other instruments, by virtue of their offices, and in the course of their official duty only, and not otherwise. Member's of the Faculty of Advocates. Officers legally authorized to conduct proceedings in the name or on behalf of His Majesty, or for the public interest, if acting solely in their respective official capacities, and not otherwise. Clerks of Shires, Stewartries or Royal Burghs in Scotland, drawing or preparing any instruments, or performing any notarial acts, which are by the law of Scotland within the exclusive department of such clerks respectively, and which must be drawn, prepared or performed by them, in consequence of their respective offices, and not otherwise. Any other public officers, drawing or preparing deeds or instruments by virtue of their respective offices, and in the course of their official duty, and not otherwise. Officers legally authorized to conduct proceedings in the name or on behalf of His Majesty, or for the public interest, if acting solely in their respective-official capacities, and not otherwise. The above Certificate to authorize any Proctor of an Ecclesiastical Court obtaining the same, to practise as a Proctor in any Court in Ireland. CERTIFICATE of admission to Degrees in the Universities.-See TESTIMONIAL. CHARTER, original, of any lands or other heritable property in Scotland, holden of a subject superior.-See CONVEYANCE. CHARTER, Contract, Decree of Adjudication in Implement or of Sale, in Scotland, or the first extract or official copy of any such Decree operating as a conveyance upon the sale. The same Duty as for a Conveyance on Sale. 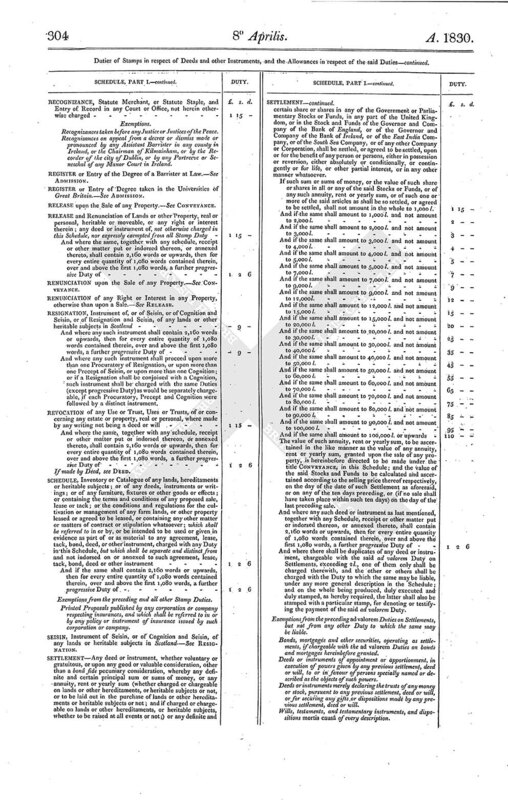 If granted for any purchase or consideration money, directly or indirectly paid, secured or agreed to be paid, other than such casualty or casualties or superiority as may be exigible by law, or under preceding investitures; and unless the ad valorem Duty or Duties of a conveyance on sale shall have been paid on some other deed or instrument, to which reference is made in such Charter or Precept The same Duty or Duties as for a Conveyance on Sale. CLERKSHIP, Articles or Contract of.-See APPRENTICESHIP ARTICLES. COGNITION.-Instrument of Cognition and Seisin.-See RESIGNATION. The value to be ascertained by certificate of the Archbishop, Bishop, or Vicar General of the Diocese; provided always that two or more Benefices episcopally united, shall be deemed one Benefice only. COLLATION by any Archbishop or Bishop to any other Ecclesiastical Benefice, Dignity, Curacy, or Promotion whatsoever,-See DISPENSATION, DONATION, FACULTY, GIFT, INSTITUTION, and PRESENTATION. Commissions granted to Officers of Yeomanry Cavalry or Volunteer Infantry, and to Officers of the Local Militia. COMMISSION to act as a Notary Public in Scotland.-See FACULTY. COMMISSION in the nature of a Power of Attorney in Scotland.-See LETTER OF ATTORNEY. CONDITIONAL Surrender of any Copyhold or Customary Estate, by way of Mortgage.-See MORTGAGE. CONSTAT of Letters Patent.-See EXEMPLIFICATION. CONTRACT of Feu or Sale in Scotland.-See CONVEYANCE, and CHARTER. CONTRACT of Excambion in Scotland.-See EXCHANGE. But if there shall be both a Feoffment and a Bargain and Sale enrolled, then the said further Duty shall not attach on either. And it is hereby declared, That the purchase or consideration-money, whether consisting of a sum or sums of money, or of the value of an annuity, rent or yearly sum, to be ascertained as hereinafter mentioned; or of the value or amount of any stock or security, as hereinafter also mentioned; or partly of a sum of money, and partly of any such value or amount respectively, shall be truly expressed and set forth in words at length, in or upon every such principal or only Deed or Instrument of Conveyance. And where any such Conveyance as aforesaid shall be made in consideration, wholly or in part of any annuity, rent or yearly sum, to be afterwards borne or paid by the purchaser, the value of such annuity, rent or yearly sum shall be ascertained in the manner hereinafter mentioned; and such value shall be deemed and taken to be the purchase or consideration money, or part of the purchase or consideration-money, as the case may be, in respect whereof the ad valorem Duty shall be charged as aforesaid. Provided always, That nothing herein contained shall be construed to charge any such ad valorem Duty in respect of any quit or chief rent, which may be issuing out of any lands or estates sold; or if the same shall be situated in Scotland, any blanche duty, or few duty or other payment, service or prestation, which may be exigible by the immediate superior thereof, in pursuance of any preceding investiture; or in respect of land-tax, tithes, or any other public or parochial burdens, or any rent or annual payment for land-tax redeemed, or for exoneration from tithes; or in respect of any copyhold rents or services for any copyhold tenements sold; or to charge with any such ad valorem Duty, assignments or transfers of leases or tacks, or of under-leases, in respect of the rents originally reserved, or prestations or services stipulated in the leases or tacks, or under-leases, thereby assigned, or transferred. 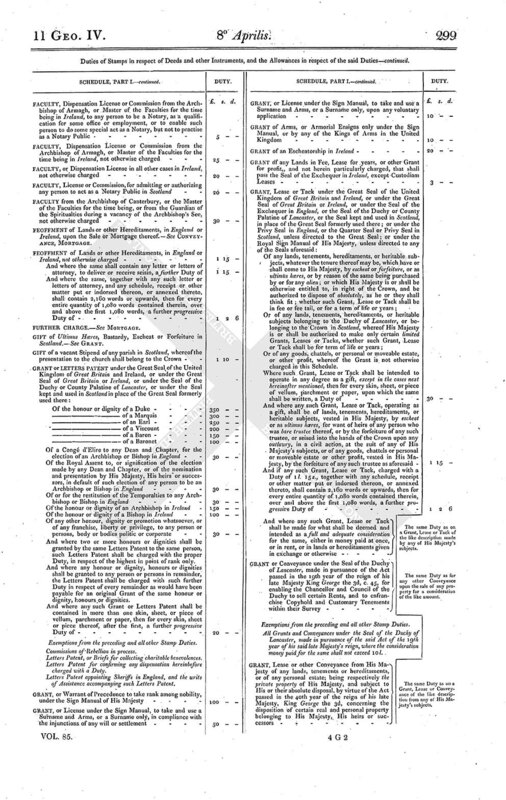 And it is hereby declared, That the value of such annuity, rent or yearly sum as aforesaid, shall be ascertained according to the Tables for the valuation of Annuities annexed to any Act in force, or which may be in force, for granting Stamp Duties on Legacies, and on successions to personal or moveable estates, in all cases to which such tables shall be applicable; and in all cases where the term, either for lives or years for which any such annuity, rent or yearly payment may be granted, shall exceed in either case in the duration of the terms calculated by such tables, then the highest value given according to such tables, either for lives or years, as the case may be, shall be deemed and taken as the value of such annuity, rent or yearly, sum; and in all cases where the term, either for a life or lives, or years, for which any such annuity, rent or yearly payment may be granted, shall be subject to any contingency which may defeat the payment thereof, then the value given according to such tables, of a term either for such life or lives, or for years, as the case may be, not subject to any contingency, shall be deemed and taken as the value of such annuity, rent or yearly sum; and in all cases in which such annuity, rent or yearly sum shall be in fee-simple or in perpetuity, the same shall be valued at and after the rate of twenty-five years purchase thereon. And where the consideration, or any part of the consideration, shall be any Stock in any of the Public Funds, or any Government Debenture, or Stock of the Banks of England or Ireland, or any Debenture or Stock of any Corporation, Company, Society, or persons or person, payable only at the will of the debtor, then the said Duty shall be calculated (Taking the same respectively, whether constituting the whole or a part only of such consideration) according to the selling price thereof respectively on the day, or on either of the ten days preceding that on which any such sale shall have taken place; or if no sale shall have taken place within such ten days on the day of the last preceding sale; and if such consideration, or part of such consideration, shall be a mortgage, judgment or bond, or a debenture, the amount whereof shall be recoverable by the holder, or any other security whatsoever, whether payable in money or otherwise, then such calculation shall be made according to the sum due thereon for both principal or interest. And where any lands or other property of different tenures or holding, or held under different titles, contracted to be sold at one entire price for the whole, shall be conveyed to the purchaser in separate parts of parcels by different deeds or instruments, the purchase or consideration money shall be divided and apportioned in such manner as the parties shall think fit; so that a distinct price or consideration for each separate part or parcel may be set forth in or upon the principal, or only deed or instrument of conveyance relating thereto, which shall be charged with the said ad valorem Duty in respect of the price or consideration-money therein set forth. And where any lands or other property, contracted to be purchased by two or more persons jointly, or by any person for himself and others, or wholly for others, at one entire price for the whole, shall be conveyed in parts or parcels, by separate deeds or instruments, to the persons for whom the same shall be purchased, for distinct parts or shares of the purchase-money, the principal or only deed of instrument or conveyance of each separate part or parcel shall be charged with the said ad valorem Duty in respect of the sum of money therein specified as the consideration for the same; but if separate parts or parcels of such lands or other property shall be conveyed to, or to the use of, or in trust for different persons, in and by one and the same deed or instrument, then such deed or instrument shall be charged with the said ad valorem Duty in respect of the aggregate amount of the purchase or consideration-monies therein mentioned to be paid, or agreed to be paid, for the lands or property thereby conveyed. 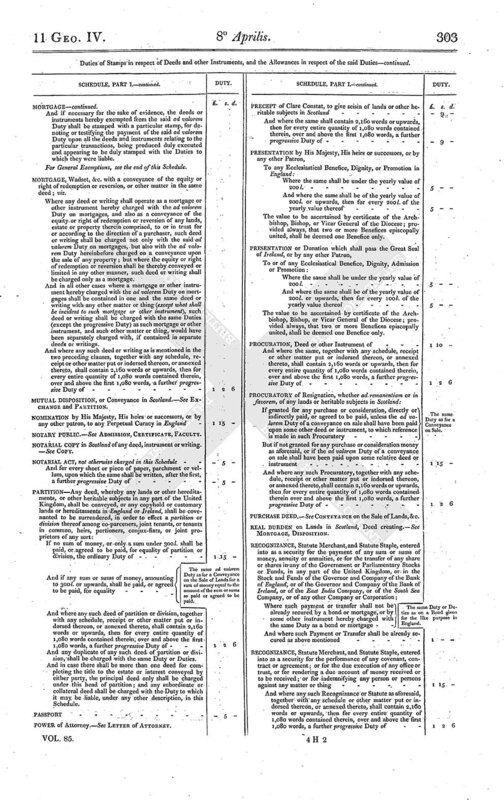 And where any person having, contracted for the purchase of any lands or other property, but not having obtained a conveyance thereof, shall contract to sell to any other person, and the same shall in consequence be conveyed immediately to the sub-purchaser, the principal or only deed or instrument of conveyance shall be charged with the said ad valorem Duty in respect of the purchase or consideration-money therein mentioned to be paid, or agreed to be paid, by the sub-purchaser. And where any person, having contracted for the purchase of any lands or other property, but not having obtained a conveyance thereof, shall contract to sell the whole, or any part or parts thereof, to any other person or persons, and the same shall in consequence be conveyed by the original seller to different persons, in parts or parcels, the principal or only deed or instrument of conveyance of each part or parcel thereof shall be charged with the said ad valorem Duty in respect only of the purchase or consideration money which shall be therein mentioned to be paid, or agreed to be paid, for the same, by the person or persons to whom or to whose use, or in trust for whom the conveyance shall be made, without regard to the amount of the original purchase-money. And in all cases of such sub-sales as aforesaid, the sub-purchasers, and the persons immediately selling to them, shall be deemed and taken to be the purchasers and sellers within the intent and meaning of the provisions and regulations relating to the ad valorem Duties on Conveyances on the Sale of Property. But where any sub-purchaser shall take an actual conveyance of the interest of the person immediately selling to him, which shall be chargeable with the said ad valorem Duty in respect of the purchase or consideration-money paid, or agreed to be paid, by him, and shall be duly stamped accordingly, any deed or instrument of conveyance to be afterwards made to him of the property in question, by the original seller, shall be exempted from the said ad valorem Duty, and be charged only with the ordinary Duty on deeds or instruments of the same kind not upon a sale. And where any lands or other property, separately contracted to be purchased of the same or of different persons, at separate and distinct prices, shall be conveyed to the purchaser, or as he shall direct, in and by one and the same deed or instrument, such deed or instrument shall be charged with the said ad valorem Duty, in respect of the aggregate amount of the purchase or consideration-monies therein mentioned to be paid, or agreed to be paid for the same. And where any lands or other property shall be sold and conveyed in consideration, wholly or in part, of any sum of money charged thereon by way of mortgage, wadset, bond, annuity or otherwise, and then due and owing to the purchaser, or shall be sold and conveyed, subject to any mortgage, wadset, annuity, bond or other debt, or to any gross or entire sum of money, to be afterwards paid by the purchaser, such sum of money or debt, or the value of such annuity, shall be deemed the purchase or consideration money, or part of the purchase or consideration money, as the case may be, in respect whereof the said ad valorem Duty is to be paid. That where any lands or hereditaments in England or Ireland shall be conveyed by bargain and sale enrolled, and also by lease and release or feoffment, with or without any such letter or letters of attorney therein contained as aforesaid, the release or feoffment shall be deemed the principal deed, and the bargain and sale shall be charged only with the Duty hereby imposed on deeds in general-[See DEED. ]-But the same shall not be enrolled, or be available, unless also stamped for testifying the payment of the ad valorem Duty on the release or feoffment. And where any lands or hereditaments shall be conveyed by lease and release, and also by feoffment, with or without any such letter or letters of attorney therein contained as aforesaid, the release shall be deemed the principal deed, and the feoffment shall be charged only with the Duty hereby imposed on deeds in general- [See DEED. ]-But the same shall not be available, unless also stamped for testifying the payment of the ad valorem Duty on the release. And where any copyhold or customary estate shall be conveyed by a deed of bargain and sale, or other instrument, by virtue of any power without a surrender, the deed of bargain and sale, or other instrument, shall be deemed the principal instrument. And in other cases of copyhold or customary estates, the surrender or voluntary grant, or the memorandum thereof respectively, if made out of court, or the copy of court roll of the surrender or voluntary grant, if made in court, shall be deemed the principal instrument. And grants, and copies-of court roll of grants of copyhold or customary estates for a life or lives, are to be charged as well as those for any greater interest. And where in Scotland there shall be a disposition or assignation, charter or contract executed by the seller, and any other instrument or instruments, writing or writings, to complete the title, the disposition or assignation, charter or contract, shall be deemed the principal instrument. And where upon the sale of any annuity or other right not before in existence, the same shall not be created by actual grant or conveyance, but shall only be secured by bond, warrant of attorney, covenant, contract, or otherwise, the bond or other instrument by which the same shall be secured, or some one of such instruments, if there be more than one, shall be deemed and taken to be liable to the same duty as an actual grant or conveyance. And in the case of leases or tacks, where a yearly rent of 5£. or upwards shall be reserved as part of the consideration for the same, there shall be charged a further duty; for which, see TITLE, LEASE. And where there shall be several deeds, instruments or writings, for completing the title to the property sold, such of them as are not liable to the said ad valorem Duty, shall be charged with the Duty to which the same may be liable under any general or particular description of such deeds, instruments or writings contained in this Schedule. And where in any case not hereby expressly provided for, of several deeds, instruments or writings, a doubt shall arise which is the principal, it shall be lawful for the parties to determine for themselves which shall be so deemed, and to pay the said ad valorem Duty thereon accordingly; and, if necessary, the other deeds, instruments or writings on which the doubt shall have arisen, shall be stamped with a particular stamp for denoting or testifying the payment of the ad valorem Duty upon all the deeds or instruments being produced duly executed, and appearing to be duly stamped in other respects. And where there shall be duplicates of any deed or instrument, except a decree in Scotland, chargeable with the said ad valorem Duty, exceeding 2£., one of them only shall be charged therewith, and the other or others shall be charged with the ordinary Duty on deeds or instruments of the same kind not upon a sale; and on the whole being produced duly executed and duly stamped as hereby required, the latter shall also be stamped with a particular stamp for denoting or testifying the payment of the said ad valorem Duty. And where there shall be duplicates, or second or subsequent extracts, or office copies of any decree in Scotland, operating as a conveyance upon the sale of any property, only one such extract shall be chargeable with Stamp Duty; and (provided the same shall be duly charged and marked upon such extract), every other or subsequent extract of such decree shall be exempt from Duty. And no Duty shall be charged upon any extract of such decree, if the appropriate Conveyance Duty upon the sale of the property of which such decree shall operate as a conveyance, shall have been regularly paid upon some other deed or instrument, and if the production of such other deed or other instrument, and the fact of its bearing the appropriate stamp thereupon, shall be duly ascertained by the proceedings forming the record of such decree. And where any deed or instrument operating as a conveyance on the sale of any property, shall operate also as a conveyance of any other than the property sold by way of settlement, or for any other purpose, or shall also contain any other matter or thing besides what shall be incident to the sale and conveyance of the property sold, or relate to the title thereto, every such deed or instrument shall be charged, in addition to the Duty to which it shall be liable as a conveyance on the sale of property, and to any progressive Duty to which it may also be liable, with such further Stamp Duty as any separate deed, containing the other matter, would have been chargeable with, exclusive of the progressive Duty. Exemptions from the preceding ad valorem Duties on Conveyances upon the Sale of Lands, &c.
All surrenders and other instruments relating only to copyhold or customary estates, whose clear yearly value shall not exceed 20s., but which are hereinafter otherwise charged. All transfers of shares in the stock and funds of the Governor and Company of the Bank of England, and of the South Sea and East India Companies, but which are hereinafter otherwise charged. Transfer of any mortgage, wadset or bond, where no sum is given or paid as a consideration for such transfer, beyond the amount of the money or stock originally secured by such mortgage, wadset or bond. And see GENERAL EXEMPTION at the end of this Schedule. CONVEYANCE of Lands and Rents belonging to the Crown.-See GRANT. CONVEYANCE of any Estate or Property in trust for sale, which shall be intended only as a security for money or stock.-See MORTGAGE. CONVEYANCE of the Equity or Right of Redemption or Reversion of Lands or other property to a purchaser, in the same deed with a mortgage, wadset or other security, made thereupon.-See MORTGAGE. Where such copy shall be made for the security or use of any person, being a party to, or taking any benefit or interest immediately under, such agreement, contract, bond, deed or other instrument The same Duty or Duties as for the original Instrument. And all copies which shall at any time be offered in evidence, shall be deemed to have been made for that purpose. All copies attested or authenticated as aforesaid, which shall be made for the private use only of any person having the custody of the original instruments, or of his or her counsel, attorney or solicitor. Exemptions from the preceding and all other Stamp Duties. Copies or Extracts of Protests upon Bills or Promissory Notes, for any sum under 40s. sterling. Copies or Extracts of any Testamentary Instruments, or any Inventory of Personal Estate, recorded in any Commissary Court in Scotland. Extracts of Commissions of persons as delegates or representatives to the General Assembly, or to any Presbytery or Church Court in Scotland; and of Commissions of delegates to the Convention of Royal Burghs; and of Commissions of delegates from any Royal Burgh, for the election of Members of Parliament. Copies of all Memorials included in searches issued from, the Registry Office in Ireland, called Negative Searches, having the Duty thereon charged. COPYHOLD ESTATES, and Customary Estates, passing by surrender and admittance, or by admittance only, and not by deed; INSTRUMENTS relating thereto, not otherwise charged under the head of Mortgage, or of Conveyance upon the Sale of Lands; viz. And where both a surrender and admittance, or more than one surrender or admittance, or the memorandum thereof, shall be contained in the same piece of vellum, parchment or paper, whether upon a sale, mortgage or other occasion, the proper Duty shall be paid in respect of each surrender and each admittance. See also CONVEYANCE upon the Sale of Lands, &c. and MORTGAGE. And where copies of both a surrender and admittance, or of more than one surrender or admittance, shall be contained in the same piece of vellum, parchment or paper, whether upon a sale, mortgage or other occasion, the proper Duty shall be paid in respect of each surrender and each admittance, except in the case of a recovery hereinafter provided for. The Copy of Court Roll of the several surrenders, admittances and other acts, which shall first take place in Court for the purpose of perfecting a common recovery of any entailed, copyhold or customary estate or estates, tenement or tenements from the surrender, to make a tenant to the præcipe, down to the admittance of the tenant in tail in fee, or to the admittance for life of the former tenant for life, with remainder to the tenant in tail in fee, upon the surrender of the demandant, both inclusive; or from the surrender to make a tenant to the præcipe inclusive, to the admittance of the tenant in tail or tenant for life, otherwise than as aforesaid, or to the admittance of any other person upon the surrender of the demandant, exclusive; where the clear yearly value of the estate shall exceed 20s. And if the Copy of Court Roll of any other admittance or surrender, admittances or surrenders, shall be contained in the same piece of vellum, parchment or paper, with the Copy of Court Roll of the several surrenders, admittances and other acts for the purpose aforesaid, the same shall be charged with such and the same Duty or Duties as if the same had been written upon a separate piece of vellum, parchment or paper, over and above the said Duties hereby imposed on the Copy of Court Roll of the recovery. Any voluntary grant by the Lord or Lady, or Steward of any Manor, made out of Court, or the memorandum thereof, with or without admittance thereon, where the clear yearly value of the estate shall exceed 20s. Twice See also CONVEYANCE upon the Sale of Lands, &c. and MORTGAGE. 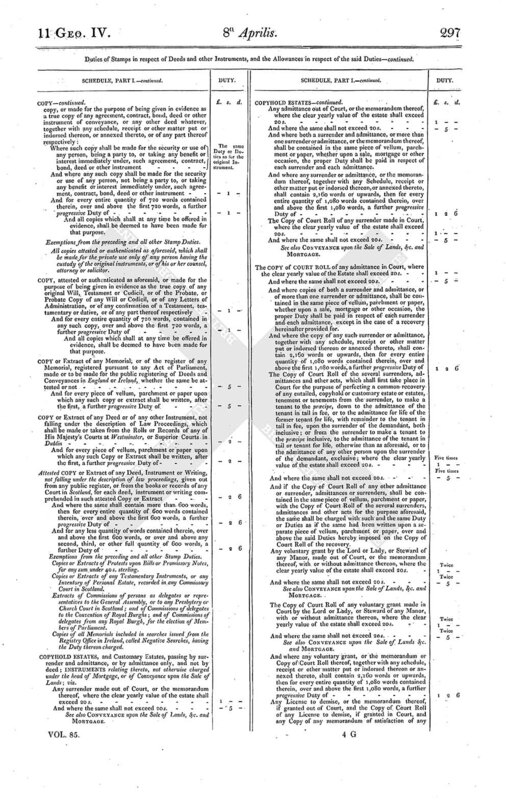 The Copy of Court Roll of any voluntary grant made in Court by the Lord or Lady, or Steward of any Manor, with or without admittance thereon, where the clear yearly value of the estate shall exceed 20s. See also CONVEYANCE upon the Sale of Lands &c. and MORTGAGE. Original Surrenders out of Court, and Copies of Court Roll of Surrenders in Court, to the uses of a will, or to a Trustee for the uses or purposes of a will. The Court Rolls or Books of any Manor, wherein the Proceedings relating thereto shall be entered or minuted. See also GENERAL EXEMPTIONS at the end of this Schedule. Exemptions from the preceding and all other Stamp Duties. All Debentures or Certificates for Bounty, exempted from Stamp Duty by any Act or Acts of Parliament granting a Bounty on the exportation of linens or sail cloth. DEBENTURE of any other kind.-See MORTGAGE. DECREE of ADJUDICATION in Implement, or of Sale in Scotland.-See CHARTER and CONVEYANCE. DEED, whereby any real burden shall be declared or created on lands or heritable subjects in Scotland.-See MORTGAGE, DISPOSITION. DEED containing an obligation to infeft any person, in heritable subjects in Scotland, under a clause of reversion, as a security for money, but without any personal bond or obligation therein for payment of the money intended to be secured.-See MORTGAGE. DEFEAZANCE-Deed or other Instrument of Defeazance of any conveyance, disposition, assignation or tack, apparently absolute, but intended only as a security for money or stock.-See MORTGAGE. The value to be ascertained by certificate of the Archbishop, Bishop, or Vicar General of the Diocese. DISPOSITION of Lands or Heritable Subjects in Scotland, to singular successors or purchasers.-See CONVEYANCE. Such disposition shall be charged, not only with the ad valorem and progressive Duties hereinbefore charged on a conveyance upon the sale of lands or heritable subjects in Scotland, but also with the ad valorem Duty hereinafter charged on any deed creating a real burden on lands in Scotland.-See CONVEYANCE, MORTGAGE. DISPOSITION in Security in Scotland.-See MORTGAGE. DISPOSITION of any Wadset, Heritable Bond, &c.-See MORTGAGE. The value to be ascertained by certificate of the Archbishop, Bishop or Vicar General of the Diocese; provided always, that two or more Benefices episcopally united, shall be deemed one Benefice only. EIK to a REVERSION.-See MORTGAGE. And if a sum of 300£. or upwards shall be paid, or agreed to be paid, for equality of Exchange The same ad valorem Duty as for a Conveyance on the Sale of Lands for a sum of money equal to the sum so paid, or agreed to be paid. And any duplicate of any such Deed of Exchange shall be charged with the same Duty or Duties; and if the exchange shall be effected or secured by separate conveyances or covenants, by distinct deeds, each deed shall be charged with the same Duty or Duties. 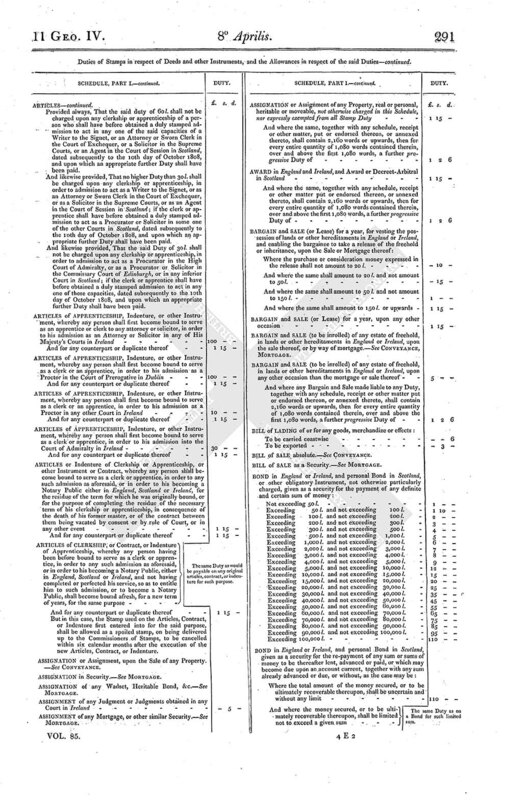 And in case there shall be more than one deed for completing the title to the lands or other hereditaments or heritable subjects conveyed by either party, the principal deed only shall be charged under this head of exchange; and any subordinate or collateral deed shall be charged with the Duty to which it may be liable under any other description in this Schedule. EXTRACTS from Registers and Records.-See COPY. FACTORY, in the nature of a Power of Attorney in Scotland.- See LETTER OF ATTORNEY. FEOFFMENT of Lands or other Hereditaments, in England or Ireland, upon the Sale or Mortgage thereof.-See CONVEYANCE, MORTGAGE. GIFT of Ultimus Hæres, Bastardy, Escheat or Forfeiture in Scotland.-See GRANT. And where two or more honours or dignities shall be granted by the same Letters Patent to the same person, such Letters Patent shall be charged with the proper Duty, in respect of the highest in point of rank only. And where any honour or dignity, honours or dignities shall be granted to any person or persons in remainder, the Letters Patent shall be charged with such further Duty in respect of every remainder as would have been payable for an original Grant of the same honour or dignity, honours or dignities. Exemptions from the preceding and all other Stamp Duties. Commissions of Rebellion in process. Letters Patent, or Briefs for collecting charitable benevolences. Letters Patent for confirming any dispensation hereinbefore charged with a Duty. Letters Patent appointing Sheriffs in England, and the writs of Assistance accompanying such Letters Patent. Or of any goods, chattels, or personal or moveable estate, or other profit, whereof the Grant is not otherwise charged in this Schedule. And where any such Grant, Lease or Tack shall be made for what shall be deemed and intended as a full and adequate consideration for the same, either in money paid at once, or in rent, or in lands or hereditaments given in exchange or otherwise The same Duty as on a Grant, Lease or Tack of the like description made by any of His Majesty's subjects. GRANT or Conveyance under the Seal of the Duchy of Lancaster, made in pursuance of the Act passed in the 19th year of the reign of his The same Duty as for late Majesty King George the 3d, c. 45, for enabling the Chancellor and Council of the Duchy to sell certain Rents, and to enfranchise Copyhold and Customary Tenements within their Survey The same Duty as for any other Conveyance upon the sale of any property for a consideration of the like amount. All Grants and Conveyances under the Seal of the Duchy of Lancaster, made in pursuance of the said Act of the 19th year of his said late Majesty's reign, where the consideration money paid for the same shall not exceed 10£..
GRANT, Lease or other Conveyance from His Majesty of any lands, tenements or hereditaments, or of any personal estate; being respectively the private property of His Majesty, and subject to His or their absolute disposal, by virtue of the Act passed in the 40th year of the reign of his late Majesty, King George the 3d, concerning the disposition of certain real and personal property belonging to His Majesty, His heirs or successors The same Duty as on a Grant, Lease or Conveyance of the like description from any of His Majesty's subjects. And where several and distinct annuities or pensions shall be granted to or for the benefit of different persons by the same instrument, the proper Duty shall be charged in respect of each annuity or pension; but where the Grant shall be of any annuity or pension to or for the benefit of two or more persons jointly, the Duty shall be charged in respect of the whole. The said fees and emoluments to be estimated according to the average amount thereof for three years preceding, where practicable; and in other cases according to the best information that can be obtained. 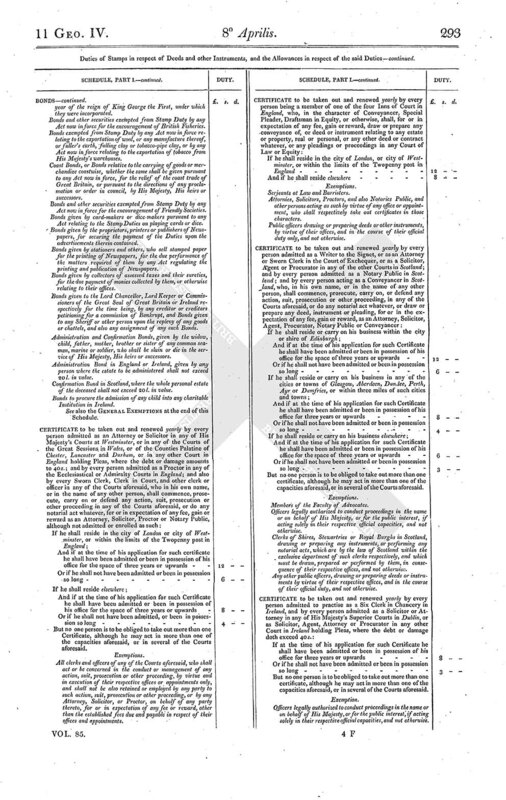 And where any such grant or appointment shall be made to or of two or more persons jointly, with separate and distinct salaries, fees or emoluments, the same shall be charged with a separate and distinct Duty, in respect of each persons, according to the amount of the salary, fees and emoluments appertaining to such person. Provided always, That no Duty shall be charged in respect of any person to whom any office or employment shall be granted anew, upon the revocation of any former grant or appointment thereof, and who shall have paid a Stamp Duty on such former grant or appointment, unless the salary, fees and emoluments appertaining to to such person shall be in any manner augmented; and in that case a Duty shall be charged, in respect of such person, only in proportion to the amount of the augmentation. 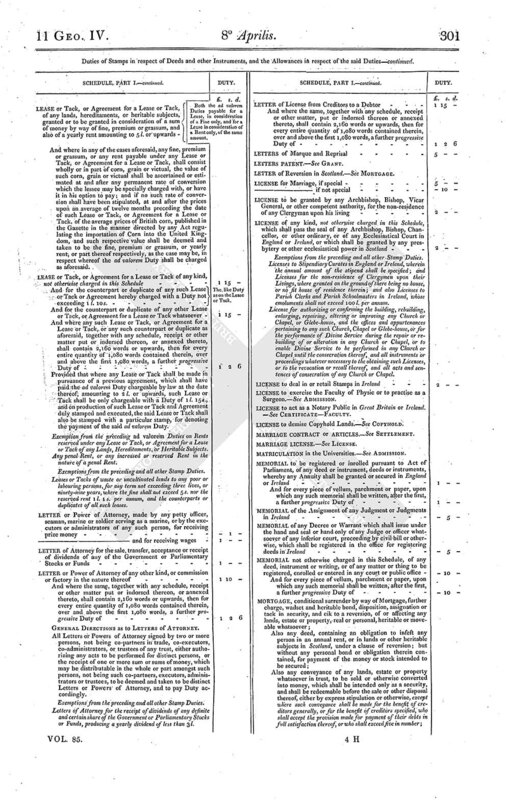 And provided always, That in case of any person holding any office or employment in or relating to the collection of His Majesty's revenue, being promoted from one office to another in the same department of the Revenue, the ad valorem Duty, hereinbefore charged shall be paid and payable on the appointment to which such person shall be promoted in respect of the increase only of the salary, fees and emoluments, above the salary, fees and emoluments of the office or employment from which the party promoted shall have been removed; unless the amount of such increase shall be equal in amount to the salary of the office from which such person is promoted, and in that case the full ad valorem Duty herein charged shall be paid on such appointment. GRANT by Copy of Court Roll.-See CONVEYANCE, COPYHOLD. GRANT upon the Sale of any Property not belonging to the Crown.-See CONVEYANCE. INDENTURES of Apprenticeship.-See APPRENTICESHIP and ARTICLES. The value to be ascertained by Certificate of the Arch bishop, Bishop or Vicar General of the diocese; provided always, that two or more benefices episcopally united shall be deemed one benefice only. INSTITUTION by any Presbytery or other competent authority to Ecclesiastical Benefices in Scotland.-See COLLATION. INSTITUTION.-See also COLLATION, LICENSE and PRESENTATION. LAND TAX, Instruments relating to the sale and redemption thereof.-See the General Exemptions at the end of this Schedule. LEASES or Tacks of Lands, &c. belonging to His Majesty, in right of the Crown or otherwise.-See GRANT. LEASES or Tracks of Lands, &c. not belonging to His Majesty; viz. LEASE (or Bargain or Sale) for a Year.-See BARGAIN and SALE. LEASE or Tack, or Agreement for a Lease or Tack of any lands, hereditaments, or heritable subjects, granted or to be granted in consideration of a sum of money by way of fine, premium or grassum paid for the same, without any yearly rent, or with any yearly rent under 5£. The same Duty as for a Conveyance on the Sale of Lands for a sum of money of the same amount. LEASE or Tack, or Agreement for a Lease or Tack, of any lands, hereditaments, or heritable subjects, granted or to be granted in consideration of a sum of money by way of fine, premium or grassum, and also of a yearly rent amounting to 5£. or upwards Both the ad valorem Duties payable for a Lease, in consideration of a Fine only, and for a Lease, in consideration of a Fine only, of the same amount. And where in any of the cases aforesaid, any fine, premium or grassum, or any rent payable under any Lease or Tack, or Agreement for a Lease or Tack, shall consist wholly or in part of corn, grain or victual, the value of such corn, grain or victual shall be ascertained or estimated at and after any permanent rate of conversion which the lessee may be specially charged with, or have it in his option to pay; and if no such rate of conversion shall have been stipulated, at and after the prices upon an average of twelve months preceding the date of such Lease or Tack, or Agreement for a Lease or Tack, of the average prices of British corn, published in the Gazette in the manner directed by any Act regulating the importation of Corn into the United Kingdom, and such respective value shall be deemed and taken to be the fine, premium or grassum, or yearly rent, or part thereof respectively, as the case may be, in respect whereof the ad valorem Duty shall be charged as aforesaid. And for the counterpart or duplicate of any such Lease or Tack or Agreement hereby charged with a Duty not exceeding 1l. 10s. The like Duty as on the Lease or Tack. Provided that where any Lease or Tack shall be made in pursuance of a previous agreement, which shall have paid the ad valorem Duty chargeable by law at the date thereof; amounting to 2£. or upwards, such Lease or Tack shall be only chargeable with a Duty of 1£. 15s., and on production of such Lease or Tack and Agreement duly stamped and executed, the said Lease or Tack shall also be stamped with a particular stamp, for denoting the payment of the said ad valorem Duty. Exemption from the preceding ad valorem Duties on Rents reserved under any Lease or Tack, or Agreement for a Lease or Tack of any Lands, Hereditaments, or Heritable Subjects. Any penal Rent, or any increased or reserved Rent in the nature of a penal Rent. Leases or Tacks of waste or uncultivated lands to any poor or labouring persons, for any term not exceeding three lives, or ninety-nine years, where the fine shall not exceed 5 s. nor the reserved rent 1l 1s. per annum, and the counterparts or duplicates of all such leases. GENERAL DIRECTIONS as to LETTERS of ATTORNEY. All Letters or Powers of Attorney signed by two or more persons, not being co-partners in trade, co-executors, co-administrators, or trustees of any trust, either authorizing any acts to be performed for distinct persons, or the receipt of one or more sum or sums of money, which may be distributable in the whole or part amongst such persons, not being such co-partners, executors, administrators or trustees, to be deemed and taken to be distinct Letters or Powers of Attorney, and to pay Duty accordingly. LETTER of Reversion in Scotland.-See MORTGAGE. Licenses to Stipendiary Curates in England or Ireland, wherein the annual amount of the stipend shall be specified; and Licenses for the non-residence of Clergymen upon their Livings, where granted on the ground of there being no house, or no fit house of residence therein; and also Licenses to Parish Clerks and Parish Schoolmasters in Ireland, whose emoluments shall not exceed 100£. per annum. License for authorizing or confirming the building, rebuilding, enlarging, repairing, altering or improving any Church or Chapel, or Glebe-house, and the offices and appurtenances pertaining to any such Church, Chapel or Glebe-house, or for the performance of Divine Service during the repair or rebuilding of or alteration in any Church or Chapel, or to enable Divine Service to be performed in any Church or Chapel until the consecration thereof, and all instruments or proceedings whatever necessary to the obtaining such Licenses, or to the revocation or recall thereof, and all acts and sentences of consecration of any Church or Chapel. LICENSE to exercise the Faculty of Physic or to practise as a Surgeon.-See ADMISSION. LICENSE to act as a Notary Public in Great Britain or Ireland.-See CERTIFICATE-FACULTY. LICENSE to demise Copyhold Lands.-See COPYHOLD. MARRIAGE CONTRACT or ARTICLES.-See SETTLEMENT. MARRIAGE LICENSE.-See LICENSE. MATRICULATION in the Universities.-See ADMISSION. And where the same respectively shall be made as a security for the re-payment of money to be thereafter lent, advanced or paid, or which may become due upon an account current, together with any sum already advanced or due, or without, as the case may be, other than and except any sum or sums of money to be advanced for the insurance of any property comprised in such mortgage or security against damage by fire, or for the insurance of any life, or for the payment of any fine or rent, in order to obtain the renewal of any lease, or of any sum for preserving and keeping on foot only such mortgage or security, or for reimbursing any trustee any costs or expenses incident to the execution of any trust or power, and except also the interest of any sum or sums of money to be advanced for any such specific purpose as aforesaid. But if the total amount of the money secured, or to be ultimately recoverable thereupon, shall be limited not to exceed a given sum The same Duty as on a Mortgage or Wadset for such limited sum. And where the same respectively shall be made as a security for the transfer or re-transfer of any share in any of the Government or Parliamentary Stocks or Funds, in any part of the United Kingdom, or in the Stock and Funds of the value of the Governor and Company of the Bank of England, or of the Governor and Company of the Bank of Ireland, or of the East India Company, or of the South Sea Company, or of any other Company or Corporation, in consideration of stock or money advanced or lent at the time, or previously due and owing, or for borne to be paid, being payable The same Duty as on a Mortgage or Wadset for a sum of money equal to the value of the Stock or Funds secured, according to the average price thereof, on the day of the date of the Mortgage or other instrument aforesaid, or on either of the ten days preceding. And where the same respectively shall be made as a security for the payment of a sum of money, and also for the transfer or re-transfer of a share in any of the said Stocks or Funds, the said ad valorem Duty shall be charged in respect of each. And in case the same respectively shall be made as a security for the payment or transfer, to different persons, of separate and distinct sums of money, or share in any of the said Stocks or Funds, the said ad valorem Duty shall be charged for and in respect of each separate and distinct sum of money or share in any of the said Stocks or Funds therein specified and secured, and not upon the aggregate amount thereof. And if any further sum of money or stock be added to the principal money or stock already secured The same Duty as on a Mortgage, Wadset or Bond, for such further sum of Money or Stock only. But if upon a Sale, see title CONVEYANCE. 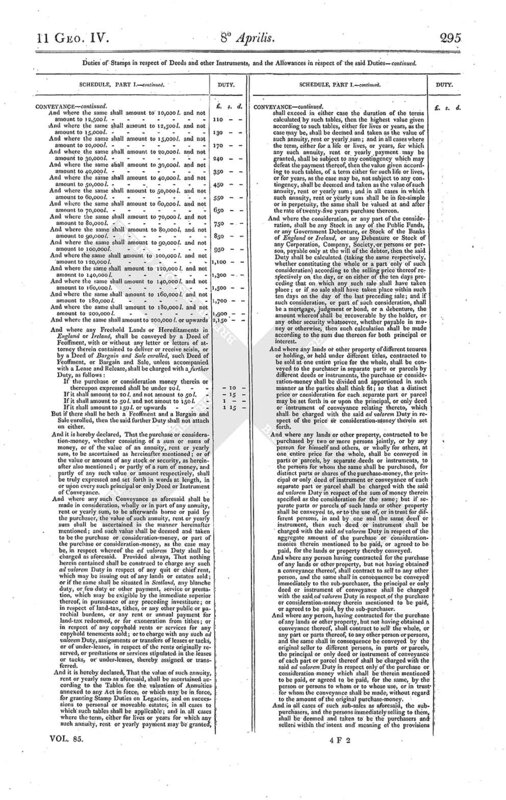 Provided always, that where several distinct deeds or instruments falling within the description of any of the instruments hereby charged with the said ad valorem Duty on mortgages and wadsets shall be made at the same time for securing the payment or transfer of one and the same sum of money, and the same share of any of the Stocks or Funds before mentioned, and the said ad valorem Duty, if exceeding 2£. shall be charged only on one of the said deeds or instruments, and all the rest shall be charged with the Duty to which the same may be liable, under any more general description of such deeds or instruments contained in this Schedule; and if required for the sake of evidence, all the rest of such deeds or instruments shall be also stamped with some particular stamp for denoting or testifying the payment of the said ad valorem Duty, on all the said deeds or instruments being produced duly executed and duly stamped, with the Duties hereby charged thereon. And where any Copyhold or customary lands or hereditaments shall be mortgaged, by means of a conditional surrender or grant, the said ad valorem Duty shall be charged on the surrender or grant, or the memorandum thereof, if made out of court, or on the copy of courtroll of the surrender or grant, if made in court. And where any Copyhold or customary lands or hereditaments shall be mortgaged or charged, together with other property, for securing one and the same sum of money, or one and the same share of any of the Stocks or Funds before mentioned, the said ad valorem Duty shall be charged on the deed or instrument relating to the other property. And where there shall be duplicates of any deed or instrument, chargeable with the said ad valorem Duty on mortgages and wadsets, exceeding 2£. one of them only shall be charged therewith, and the other or others shall be charged with the Duty to which the same may be liable, under any more general description in this Schedule; and on the whole being produced, duty executed and duly stamped, as hereby required, the latter shall also be stamped with a particular stamp, for denoting or testifying the payment of the said ad valorem Duty. Exemptions from the said ad valorem Duty on Mortgages, &c. but not from any other Duty to which the same may be liable. Any Deed or other Instrument, made in pursuance of and conformably to any agreement, contract or bond, charged with, and which shall actually have paid the said ad valorem Duty, or the ad valorem Duty on Bonds or Mortgages granted by the Acts of the 48th Geo. 3, c. 149; 55th Geo. 3, c. 78; 55th Geo. 3, c. 184, or the 56th Geo. 3, c. 56. 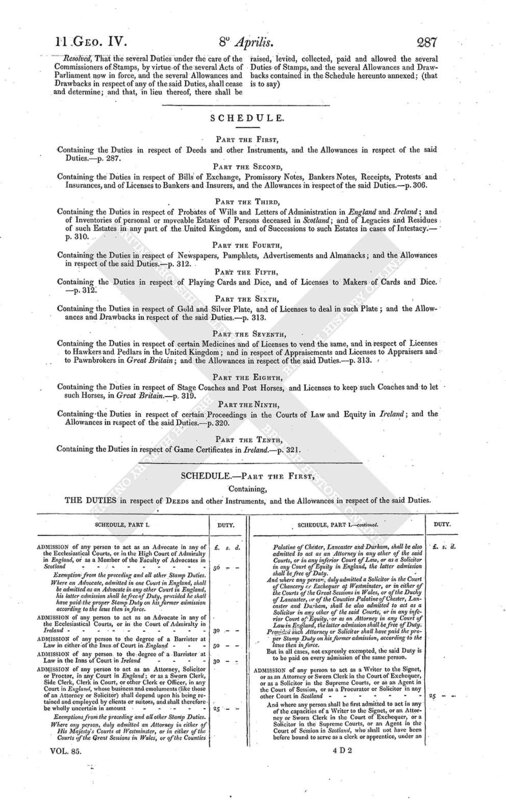 Any Deed or other Instrument made for the further assur-ance only of any estate or property already mortgaged, pledged or charged as a security by any deed or instrument which shall have paid the said ad valorem Duty hereby charged, or the ad valorem Duty on Bonds or Mortgages or Heritable Bonds imposed by the Act of the 44th Geo. 3, c. 98, or by the said Acts of the 48th Geo. 3, c. 149; 55th Geo. 3, c. 78; 55th Geo. 3, c. 184; or the 56th Geo. 3, c. 56. 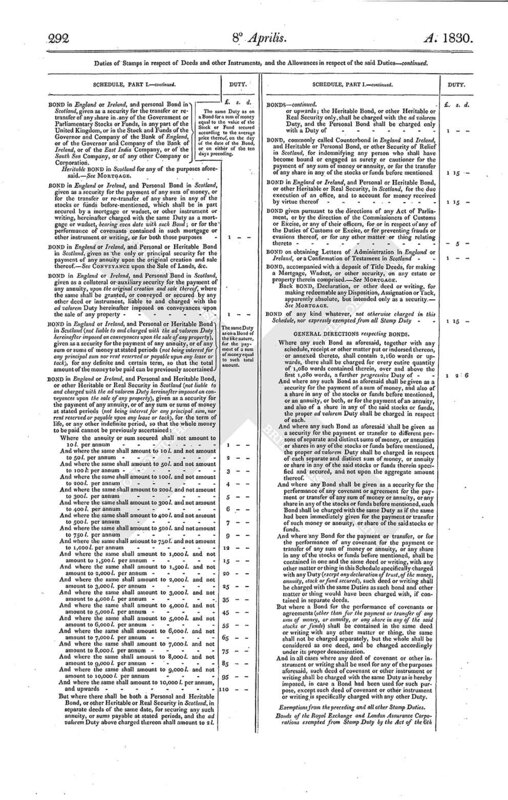 Any Deed or other Instrument made for the further assurances only of any estate or property already mortgaged, pledged or charged as a security by any deed or instrument which shall have paid the said ad valorem Duty hereby charged, or the ad valorem Duty on Bonds or Mortgages or Heritable Bonds imposed by the Act of the 44th Geo. 3, c. 98, or by the said Acts of the 48the Geo. 3. c. 149; 55th Geo. 3, c. 78; 55th Geo. 3, c. 184; or the 56the Geo. 3, c. 56. 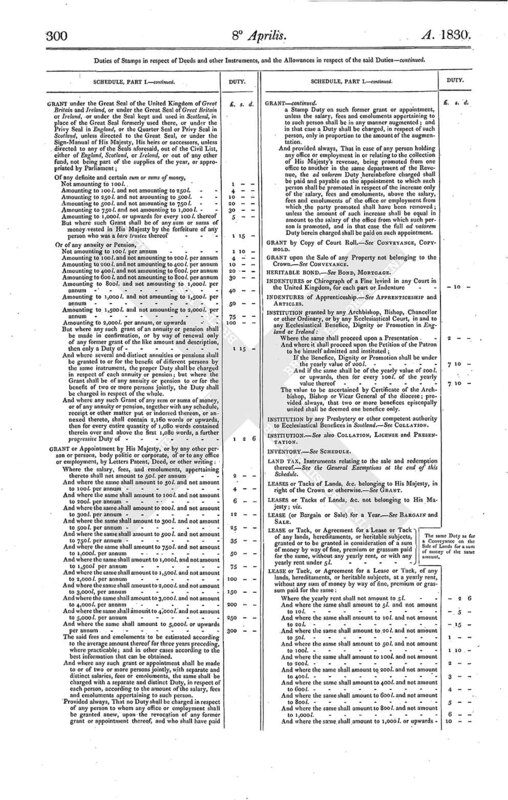 Any Deed or other Instrument made as an additional or further security for any sum of sums of money, or any share or shares of any of the Stocks or Funds before mentioned, already secured by any deed or instrument which shall have paid the said ad valorem Duty on Mortgages or Bonds hereby charged, or the ad valorem Duty on Mortgages or Bonds charged by the said Act of the 44th, or the said Act of the 48th, or the said Act of the 55th, year of the said Act of thereign of his said late Majesty King George to be exempt from the said ad valorem Duty hereby charged, so far as regards such sum or sums of money, or such share or shares of any of the said Stocks or Funds before secured; but if any further sum of money or stock shall be added to the principal money or stock already secured, the said ad valorem Duty shall be charged in respect of such further sum of money or stock. And if necessary for the sake of evidence, the deeds or instruments hereby exempted from the said ad valorem Duty shall be stamped with a particular stamp, for denoting or testifying the payment of the said ad valorem Duty upon all the deeds and instruments relating to the particular transactions, being produced duly executed and appearing to be duly stamped with the Duties to which they were liable. For General Exemptions, see the end of this Schedule. MORTGAGE, Wadset, &c. with a conveyance of the equity or right of redemption or reversion, or other matter in the same deed; viz. Where any deed or writing shall operate as a mortgage or other instrument hereby charged with the ad valorem Duty on mortgages, and also as a conveyance of the equity or right of redemption or reversion of any lands, estate or property therein comprised, to or in trust for or according to the direction of a purchaser, such deed or writing shall be charged not only with the said ad valorem Duty on mortgages, but also with the ad valorem Duty hereinbefore charged on a conveyance upon the sale of any property; but where the equity or right of redemption or reversion shall be thereby conveyed or limited in any other manner, such deed or writing shall be charged only as a mortgage. And in all other cases where a mortgage or other instrument hereby charged with the ad valorem Duty on mortgages shall be contained in one and the same deed or writing with any other matter or thing (except what shall be incident to such mortgage or other instrument), such deed or writing shall be charged with the same Duties (except the progressive Duty) as such mortgage or other instrument, and such other matter or thing, would have been separately charged with, if contained in separate deeds or writings. MUTUAL DISPOSITION, or Conveyance in Scotland.-See EXCHANGE and PARTITION. NOTARY PUBLIC.-See ADMISSION, CERTIFICATE, FACULTY. NOTARIAL COPY in Scotland of any deed, instrument or writing.-See COPY. The same ad valorem Duty as for a Conveyance on the Sale of Lands for a sum of money equal to the amount of the sum or sums so paid or agreed to be paid. And any duplicate of any such deed of partition or division, shall be charged with the same Duty or Duties. And in case there shall be more than one deed for completing the title to the estate or interest conveyed by either party, the principal deed only shall be charged under this head of partition; and any subordinate or collateral deed shall be charged with the Duty to which it may be liable, under any other description, in this Schedule. POWER of Attorney.-See LETTER of ATTORNEY. The value to be ascertained by certificate of the Archbishop, Bishop, or Vicar General of the Diocese; provided always, that two or more Benefices episcopally united, shall be deemed one Benefice only. 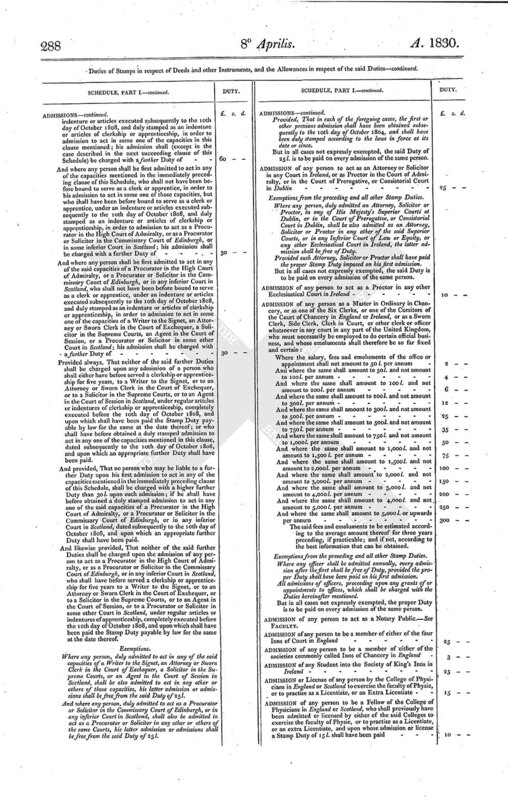 If granted for any purchase or consideration, directly or indirectly paid, or agreed to be paid, unless the ad valorem Duty of a conveyance on sale shall have been paid upon some other deed or instrument, to which reference is made in such Procuratory The same Duty as for a Conveyance on Sale. PURCHASE DEED.-See CONVEYANCE on the Sale of Lands, &c.
REAL BURDEN on Lands in Scotland, Deed creating.-See MORTGAGE, DISPOSITION. Where such payment or transfer shall not be already secured by a bond or mortgage, or by some other instrument hereby charged with the same Duty as a bond or mortgage The same Duty or Duties as on a Bond given for the like purpose in England. Recognizances taken before any Justice or Justices of the Peace. Recognizances on appeal from a decree or dismiss made or pronounced by any Assistant Barrister in any county in Ireland, or the Chairman of Kilmainham, or by the Recorder of the city of Dublin, or by any Portreeve or Seneschal of any Manor Court in Ireland. REGISTER or Entry of the Degree of a Barrister at Law.-See ADMISSION. REGISTER or Entry of Degree taken in the Universities of Great Britain.-See ADMISSION. RELEASE upon the Sale of any Property.-See CONVEYANCE. RENUNCIATION upon the Sale of any Property.-See CONVEYANCE. RENUNCIATION of any Right or Interest in any Property, otherwise than upon a Sale.-See RELEASE. And where any such instrument shall proceed upon more than one Procuratory of Resignation, or upon more than one Precept of Seisin, or upon more than one Cognition; or if a Resignation shall be conjoined with a Cognition, such instrument shall be charged with the same Duties (except progressive Duty) as would be separately chargeable, if each Procuratory, Precept and Cognition, were followed by a distinct instrument. Printed Proposals published by any corporation or company respecting insurances, and which shall be referred to in or by any policy or instrument of insurance issued by such corporation or company. SEISIN, Instrument of Seisin, or of Cognition and Seisin, of any lands or heritable subjects in Scotland.-See RESIGNATION. SETTLEMENT-Any deed or instrument, whether voluntary or gratuitous, or upon any good or valuable consideration, other than a bonâ fide pecuniary consideration, whereby any definite and certain principal sum or sums of money, or any annuity, rent or yearly sum (whether charged or chargeable on lands or other hereditaments, or heritable subjects or not, or to be laid out in the purchase of lands or other hereditaments or heritable subjects or not; and if charged or chargeable on lands or other hereditaments, or heritable subjects, whether to be raised at all events or not;) or any definite and certain share or shares in any of the Government or Parliamentary Stocks or Funds, in any part of the United Kingdom, or in the Stock and Funds of the Governor and Company of the Bank of England, or of the Governor and Company of the Bank of Ireland, or of the East India Company, or of the South Sea Company, or of any other Company or Corporation, shall be settled, or agreed to be settled, upon or for the benefit of any person or persons, either in possession or reversion, either absolutely or conditionally, or contingently or for life, or other partial interest, or in any other manner whatsoever. The value of such annuity, rent or yearly sum, to be ascertained in the like manner as the value of any annuity, rent of yearly sum, granted upon the sale of any property, is hereinbefore directed to be made under the title CONVEYANCE, in this Schedule; and the value of the said Stocks and Funds to be calculated and ascertained according to the selling price thereof respectively, on the day of the date of such Settlement as aforesaid, or on any of the ten days preceding, or (if no sale shall have taken place within such ten days) on the day of the last preceding sale. And where there shall be duplicates of any deed or instrument, chargeable with the said ad valorem Duty on Settlements, exceeding 2£., one of them only shall be charged therewith, and the other or others shall be charged with the Duty to which the same may be liable, under any more general description in the Schedule; and on the whole being produced, duly executed and duly stamped, as hereby required, the latter shall also be stamped with a particular stamp, for denoting or testifying the payment of the said ad valorem Duty. Exemptions from the preceding ad valorem Duties on Settlements, but not from any other Duty to which the same may be liable. Bonds, mortgages and other securities, operating as settlements, if chargeable with the ad valorem Duties on bonds and mortgages hereinbefore granted. Deeds or instruments of appointment or apportionment, in execution of powers given by any previous settlement, deed or will, to or in favour of persons specially named or described as the objects of such powers. Deeds or instruments merely declaring the trusts of any money or stock, pursuant to any previous settlement, deed or will, or for securing any gifts or dispositions made by any previous settlement, deed or will. Wills, testaments, and testamentary instruments, and dispositions mortis causâ of every description. SURRENDER upon the Sale of Lands or other Property.-See CONVEYANCE. SURRENDER of Copyhold Lands or Tenements.-See COPYHOLD and MORTGAGE. TACK of Land, &c. in Scotland belonging to the Crown.-See GRANT. TACK of Lands, &c. in Scotland, not belonging to the Crown.-See LEASE. TACK in Security.- See MORTGAGE. TRANSFER of any share or shares in the Stock and Funds of any other Corporation, Company or Society whatever, upon the sale thereof, or by way of mortgage or security.-See CONVEYANCE, MORTGAGE. TRANSFER upon the sale of any other property.-See CONVEYANCE. TRANSFER of Mortgage, Wadset or other security.-See MORTGAGE. WARRANT of ATTORNEY (with or without a release of errors) to confess and enter up a judgment in any of His Majesty's Courts at Westminster, or in any of His Majesty's Superior Courts in Dublin, or in any of the Courts of the Great Sessions in Wales, or of the Counties Palatine of Chester, Lancaster and Durham, or in any other Court of Record holding Pleas, where the debt or damage amounts The same to 40s. which shall be given as a security for the payment of any sum of sums of money, or for the transfer of any share or shares in any of the Government or Parliamentary Stocks or Funds, in any part of the United Kingdom, or in the Stocks or Funds of the Governor and Company of the Bank of England, or of the Governor and Company of the Bank of Ireland, or the East India Company, or of the South Sea Company, or of any other Company or Corporation. The same Duty as on a Bond for the like purpose. GENERAL EXEMPTIONS from all STAMP DUTIES. All bonds, contracts, mortgages, conveyances, deeds and instruments whatever, exempted from Stamp Duty by any Act of Parliament now in force, for promoting the residence of the Parochial Clergy, by making provision for building, repairing or purchasing houses and other buildings for the use of their benefices. All affidavits, contracts, mortgages, conveyances, deeds and instruments whatever, exempted from Stamp Duty by any Act of Parliament now in force relating to the Redemption and Sale of the Land Tax. All transfers of shares in the Government or Parliamentary Stocks or Funds. All grants, leases, and other conveyances and instruments exempted from Stamp Duty by any Act of Parliament now in force relating to the Land Revenues of the Crown. All bonds, contracts and assignments relating to the Transportation of Convicts. All bills of sale, conveyances, assignments or other deeds or instruments whatever, for the sale, transfer or other disposition, either absolutely or by way of mortgage or otherwise, of any Ship or Vessel, or any part, interest, share or property of or in any Ship or Vessel, and all receipts indorsed thereon for the consideration money therein expressed or thereby secured. 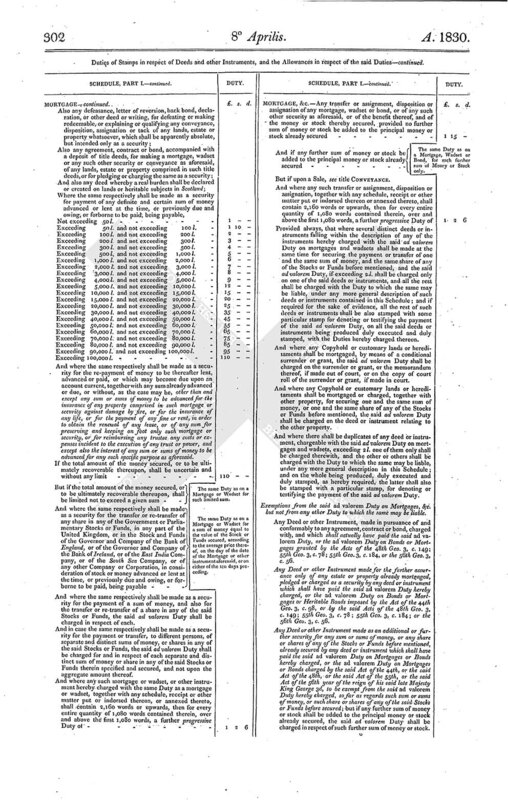 All affidavits and letters of attorney relating solely to the Estate and Effects of any Bankrupt or Bankrupts, and all deeds, instruments and writings made for the purpose of vesting any Freehold, Leasehold, Copyhold, or other property belonging to any Bankrupt or Bankrupts in any Assignee or Assignees appointed or chosen by virtue of the Commission issued against such Bankrupt or Bankrupts, for the benefit of the Creditors of him or them respectively. All deeds, instruments or writings exempted from Stamp Duty by any Act relating to the Relief of Insolvent Debtors. All dispositions and assignations, required to be granted by pursuers of processes of cessio bonorum, in Scotland, or by prisoners claiming the benefit of the Act of the Scottish Parliament, relative to the Aliment of Poor Prisoners. All deeds, instruments or writings exempted from Stamp Duty by any Act relating to the Building of additional Churches. All affidavits, bonds, debentures, orders and receipts, and all other deeds and instruments exempted from Stamp Duty, by any Act or Acts relating to Savings Banks. Proceedings of courts martial, and other instruments usually exempted by any Act in force for the punishment of Mutiny and Desertion. All bonds and warrants of attorney, or other securities entered into by any high constable or collector of any presentment, cess or public money, in pursuance of certain Acts passed in Ireland regulating such securities. 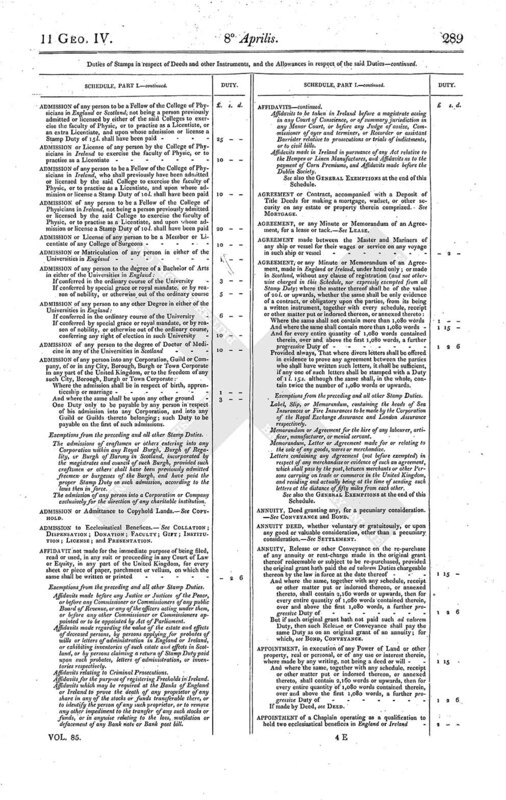 All obligations to His Majesty, heritable securities, assignments thereof, or any mortgage or assignment of any tolls, rates or duties, taken by certain Commissioners appointed by Acts passed in the fifty-seventh and fifty-eighth years of the reign of his late Majesty, authorizing the issue of Exchequer Bills for the carrying on, the Public Works and Fisheries in the United Kingdom, under the said Act, or under another Act passed in the same year of the said reign, or under an Act passed in the fifty-eighth year of the said reign, relating to such Public Works and Fisheries, and also all other instruments whatever exempted from Stamp Duty by the said Acts, or any of them, or by any Act for amending the said Acts, or any of them. All obligations or securities for money lent by Commissioners appointed under an Act passed in the first year of the reign of His present Majesty, for the assistance of Trade and Manufacture in Ireland. 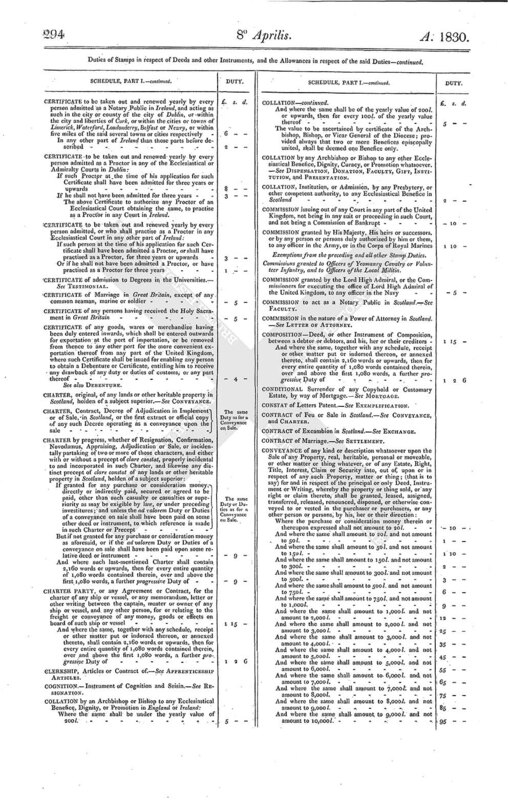 All memorandums, contracts, agreements, certificates, deeds or instruments in Ireland, which shall be given, granted or made for the purpose of carrying into effect any sale, purchase, exchange or demise, made by the Commissioners of His Majesty's Woods, Forests and Land Revenues, under any Act in force relating to the said Woods, Forests and Land Revenues. To every person, who at one and the same time shall produce at the Head Office for Stamps in Westminster or Dublin, for the purposes of being stamped, paper or parchment not written upon, charged with any Stamp Duty by this Act, to the amount in the whole of 30£. or upwards, or shall buy of the Commissioners of Stamps in Westminster or Dublin respectively, paper or parchment stamped with any Stamp Duty imposed, to the amount in the whole of 30£. or upwards, the sum of 1£. 10 s. for every 100£. and so in proportion for any greater or less sum than 100£. not under 30£. : provided always, that no such allowance shall be made in respect of any one Stamp, or any number of Stamps, impressed on any one piece of paper or parchment, amounting in the whole to 12£. or upwards, nor for any fractional part of l;. To the Treasurer for the time being of the Society of King's Inns, Dublin, the annual sum of 2,000£. in lieu of certain proportions of Stamp Duties appropriated to the use of the said Society, by an Act of the fifty-sixth year of the reign of his late Majesty King George the Third, for granting Stamp Duties in Ireland.